Please refer to our stock # 3239 when inquiring. 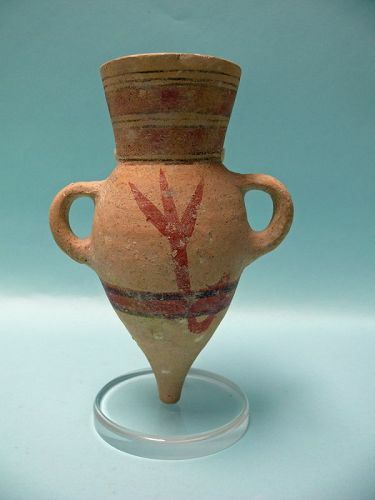 Iron Age II Israelite Pottery Wine Amphora, ca. 800 BCE. Found in a Hebron Cave. With reddish brown and black pigment. Some repair to mouth with wear due to age and use as seen in images. In good condition. 9" x 6 1/2" x 4 1/2", on custom stand 9 1/2". An Amphora is a type of container of a characteristic shape and size, descending from at least as early as the Neolithic Period. Amphorae were used in vast numbers for the transport and storage of various products, both liquid and dry, but mostly for wine. They are most often ceramic, but examples in metals and other materials have been found. Versions of the amphorae were one of many shapes used in Ancient Greek vase painting.